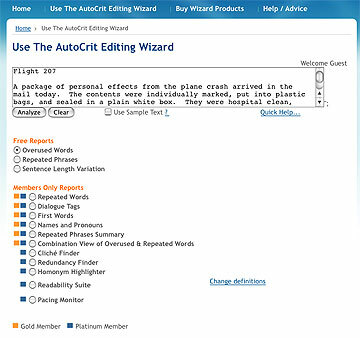 I stumbled across the AutoCrit site today and found it to be a helpful tool for editing your flash fiction stories. 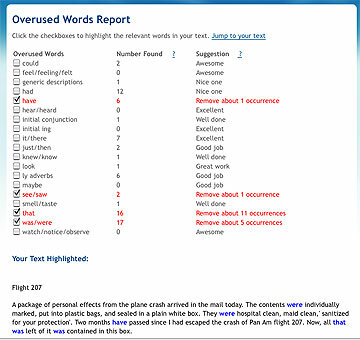 The free version allows you to paste a story of under 800 words into a text box, where you have the option of selecting reports on three categories: Overused Words, Repeated Phrases, and Sentence Length Variations. These categories are crucial to analyze when crafting a flash piece. I clicked the "Overused Words" button and clicked "Analyze." The next screen shows a list of typically overused words with red check marks pertaining to your story, as well as suggestions for how many words to remove. I definitely used "that" too many times--which is a common mistake *that* (delete!) I see a lot in flash fiction, and a bad habit of mine. In most cases, you can safely remove "that"--it doesn't add anything to the sentence--and will help trim your word count. The AutoCrit said my use of "ly adverbs" was "Excellent," as was my use of "could," "it/there," and "maybe." Other interesting areas are the use of generic descriptions (I got a "Nice one" response), the use of feel/feeling/felt (I got a "Yay"), initial conjunction ("Well done"), and initial ing ("Nice work"). The comments are encouraging and are all wonderful helpers to fix passive voice problems. Beneath the checklist is your highlighted text with culprits displayed in blue. Drag your cursor over the text and copy-paste it into your MS Word program--you'll notice the blue text copies as well. At least it did with mine. You can only select one option at a time but you can hit the back button after you've read the results and your text will still be there. Then you can select one of the other options, such as "Repeated Phrases" and "Sentence Length." Repeated Phrases: This page shows all phrases which repeat within 100 words in highlighted blue text. If you are using a repeated phrase for emphasis it can be very powerful, but remember it should contribute something to the story, so use them carefully. When in doubt, leave it out--especially in flash. It will only eat your word count. Sentence Length: This page gives you a list of the beginning of each sentence and how many words it contains. It's important to vary your sentence length because similar-length sentences can be dull to read. The AutoCrit site offers further services to those that subscribe for a fee. I haven't tried their paid services, so I can't offer a review. Their "Members Only" reports include other editing tools such as: Dialogue Tags, First Words, Names and Pronouns, Cliche Finder, Redundancy Finder, Homonym Highlighter, Readability Suite, and Pacing Monitor. But I found their free online tool to be quite helpful in trimming unnecessary words and a good reminder to really check your story for any issues you might have missed. So if you're preparing to enter the WOW! Women On Writing Flash Fiction Contest, you may want to test your story with this helpful little tool before you hit the send button.